A special thank you to Edelweiss and Penguin Publishing Group for an ARC in exchange for an honest review. In the same vein as The Mothers and one of my favourite books from last year, An American Marriage, this incredible debut is about mothers and daughters, identity and family, and the complicated relationships that can consume you instead of nurture you. The Butler family has had their share of trials—as sisters Althea, Viola, and Lillian can attest—but nothing can prepare them for the literal trial that will turn their lives upside down. Althea is the eldest of the girls and therefore the default matriarch after the death of their mother. She has had no choice but to be strong and is domineering. Therefore it comes as quite a shock to her sisters when Althea and her husband, Proctor, are arrested. They were always such upstanding citizens, active and trusted members in their community, and they are disgraced in an instant. Yet no one knows the real truth, not even the Butler sisters. Viola and Lillian are left to care for Althea and Proctor's teenage twin girls, yet they are battling their own demons that are impacting their abilities to fully care for Baby Vi and Kim. What unfolds is a story of loyalty, love, and the complexities of relationships—sometimes those we are closest to we know the least about. The story is told through each sister. Their voices are unique and their character is rich and fully developed. Gray also includes letters between Proctor and Althea during their incarceration. Although they are at the centre of the story, we never get a true sense of who they are and are left speculating like the rest of the characters and townspeople. This incredible debut was haunting and eloquent. 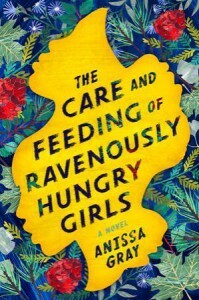 Gray's writing is stunning and complex, much like the relationships that are explored in The Care and Feeding of Ravenously Hungry Girls. She doesn't back down from issues that are real and raw—eating disorders, abuse, depression, guilt, dysfunction, etc., and her characters are left hungry for love and acceptance.